Seoul - Delayed Baggage by Air Asia!! Every year I will be travelling during March for my birthday celebration trip. This year my man gifted me a Seoul birthday trip. Our flight from Kuala Lumpur to Seoul was on 13th March 2017, 1.00am in flight no. D7 506. Due to international flight and we need to check in baggage, we reached KLIA2 at about 9.00pm to do all the necessary procedures. We printed 2 baggage tags using the kiosk, queued for the baggage drop counter, stick the baggage tags in front of the staff, and both mine and my man's baggage were checked in together. Then we went for our late dinner and prepared to fly for our Seoul trip. Upon landed Incheon International Airport at about 8.20am, we went to collect our baggage. After collecting my man's baggage, while all the other passengers already left with their baggage, my heart sort of sink because I guess something bad must be happened. One baggage department female staff came up to me and told me all bags were out. There is no sight of my pink baggage. Yeah, a Pisces' intuition is insanely accurate. I was asked to fill up a form to report on the missing baggage. Two baggage department staffs, one male and one female, were there to assist me in filling up the information. 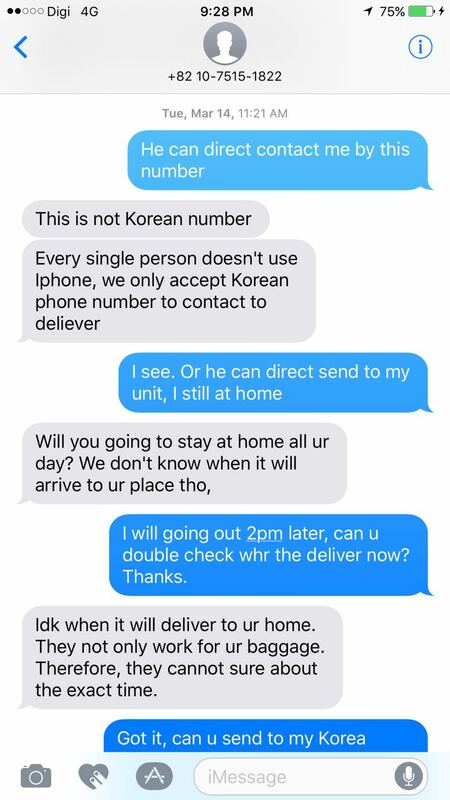 Both Koreans tried their best to communicate with us. The male staff told me there is no names printed on my baggage tags, which is weird, only got series number. 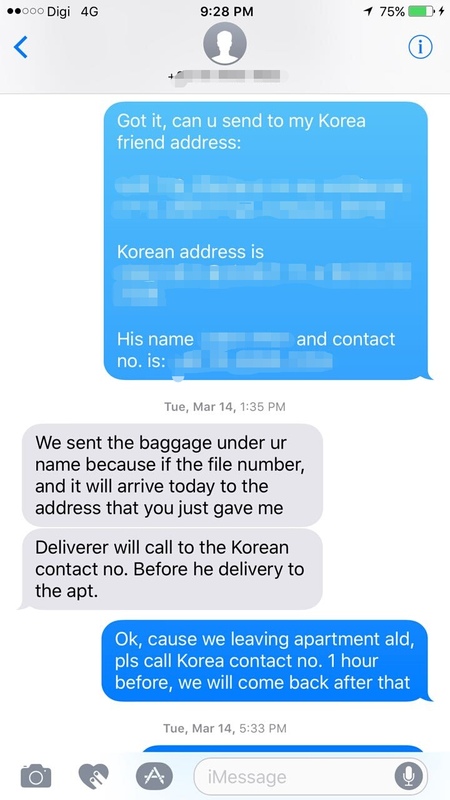 Anyway they jot down the series number, type & color of my baggage, weight of my baggage (remember to take note of the weight next time when you check in), and also got my man's iMessage contact because we do not have any Korean phone numbers. 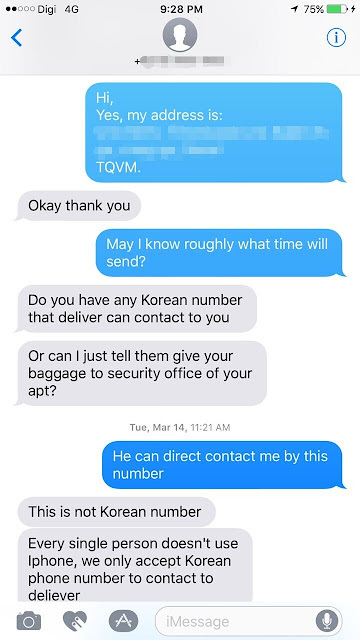 We also provided them our Airbnb address for them to return our baggage, if found. And guess what, the male staff told me EVERY SINGLE DAY there are missing baggage!!! Seriously can't believe this could happens to me! On my birthday trip some more! What a great start for my Seoul trip & great way to ruin my holiday mood! Done with the filing, i can't help but weep awhile on my man's shoulder. Whole day I wasn't really enjoy much but kept waiting for the baggage department staff's update. My man tried to iMessage him and he said no update yet. At 9.30pm, I posted this case in social media. Many kindhearted friends shared their past experiences and also advice on what shall I do. Immediately we called to Incheon International Airport - Baggage Department, the person who picked up the call told me to wait till next day and they will update me the status. Couldn't wait no more, we made a long distance call back to Air Asia Lost & Found Department Malaysia. They only picked up the call after eight attempts. Yes, EIGHT attempts, line wasn't engage, so I have no idea what took them so long. So I told this officer regarding my scenario, and I gave him my name. Immediately he said, "The Hello Kitty pink baggage right? oh it is found in KLIA2." I felt relieve a little. Then he said the baggage will be sending over to Incheon International Airport with the first flight on 14th March 2017, 1.00am, and arrived at 8.20am. Firstly, we are tourists. 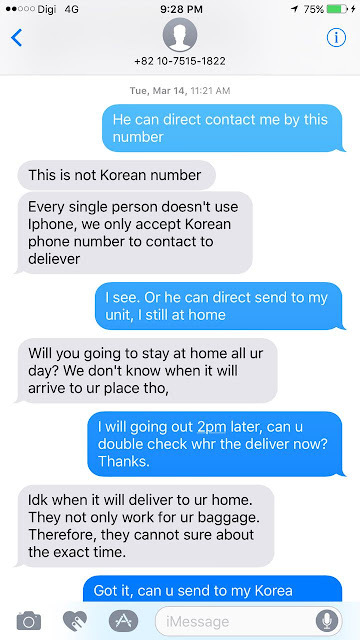 Isn't it a courtesy for you to provide us a solution or assistance when we do not have a Korea mobile number as per #2? Secondly, we are tourists. We can't possibly stay at Airbnb 24/7 just to wait for the baggage without knowing when it will be delivered as per #3. I am there for travelling, not to trying out how comfortable is the Airbnb. Thirdly, we are tourists. When knowing the hassles as per #2 and #3, we provided a solution for the Air Asia Lost & Found team as per #4. We gave them our Airbnb host's contact number & address because the host is kind enough and said he can receive on behalf and it will be safer than just to pass the baggage to the security office there. Then the Air Asia officer said cannot send to my host's address. Okay fine, you have your protocol maybe. Fourthly, we are tourists. To respect Air Asia's protocol and to avoid troubling my host to go to our Airbnb and receive the baggage, we requested the Air Asia officer to call our host an hour before the delivery man coming to our Airbnb, so that we have sufficient time to return to our Airbnb and receive the baggage as per #5. Then as you can see, no reply even after my man followed up for few times. 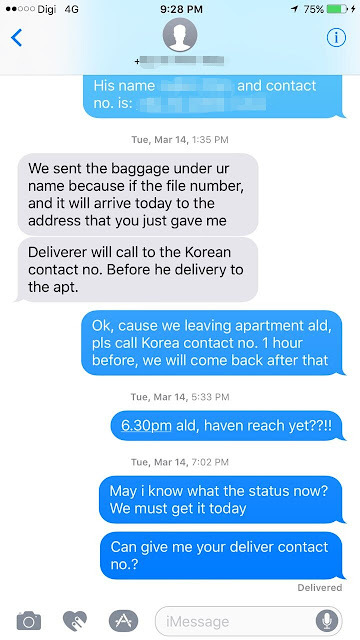 At about 9.30pm, our Airbnb host WhatsApp-ed my man and said my baggage was delivered to him. He was so kind and delivered the baggage to our Airbnb unit. Really appreciated his help! 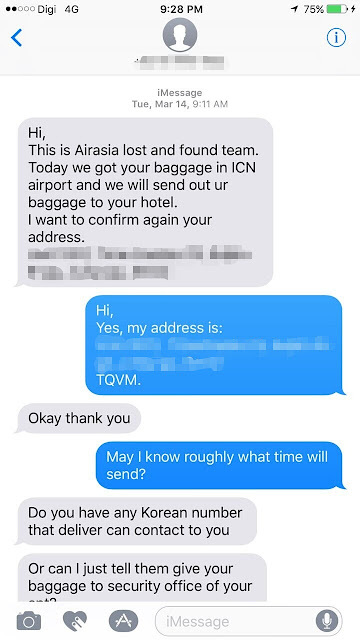 Air Asia used almost 36 hours to return my baggage and apparently no sign of compensation. I am going to claim for my extra expenses spent on clothing & necessary personal care due to their negligence. This claim is not only about financial loss, but also my psychological loss during that two days where I constantly have to worried and depressed about my missing, then delayed baggage. The reason why I blogged about this, is so that people are aware of such matter and how they can react when they face the same issue. I believe this is our right to make such claim especially I have Travel Insurance. And to be frank, Air Asia as a service provider, you should have show a sign of apology by making compensation without the need for passengers to make a claim under such circumstances. Mr Tony Fernandes, if you so happen to be reading this, you may contact me and I am looking forward to have a conversation with you on how such issue shall be settled. And I do hope your Air Asia staffs will know how to settle my claim professionally. Being rigid is not always the way of doing things. Think out of the box and be flexible.